How Angry Is That Bird? The news regarding the NSA and its British counterpart discussed how the Angry Birds app was targeted as a means to collect personal information about app users. Presumably the agencies were collecting data that the app was already accessing as part of its normal operations. What data is being accessed and should it concern us? We performed a behavioral analysis on Angry Birds for Android with our mobile application reputation service. Here’s what we found. Our first analysis was to determine whether Angry Birds contained known malicious code, or malicious behaviors. Fortunately, it’s clean in both cases. Information like phone number, IMEI, etc. Contains code that may reveal the serial number of your SIM card as well as information about the provider network with which it is attached. Contains code capable of finding the device brand, model and/or version of the operating system. Code is present that may track the location of the device based on cellular network and or/gps. This is also aware of when the location changes. Contains code that may identify and retrieve information about your mobile service provider. Code is present that allows for the tracking of device information such as battery status, signal strengths, network traffic and cpu performance. Contains code to listen for key and touch events and take action via callbacks. While this is a normal API enabled ability it may be combined with other nefarious methods. In regards to geo-location, Angry Birds received one code capability violation and one permission violation. Angry Birds is currently the 18th most popular game for Android in the Google Play Store. All 100 top free games in the Google Play Store have code capabilities violations for privacy/personal information policy, many with a similar granularity of violations. 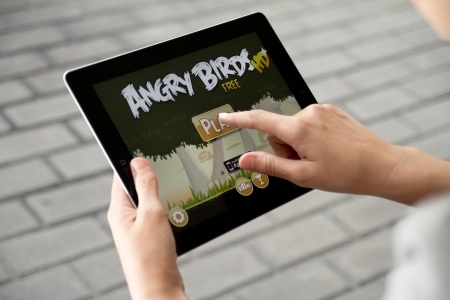 Compared to other top 100 free games, Angry Birds is categorized as one of the least risky for malware and privacy.